CULLMAN COUNTY – Last week was the start of region play for most of our local squads and the results were mixed to say the least. Some teams pulled away with late-game heroics while others couldn’t quite keep pace. Either way, last Friday night featured a lot of important, early season matchups. It wasn’t a region game, but that doesn’t mean there wasn’t plenty of drama in the Eagles’ win over the Warriors. Vinemont scratched and clawed its way to a win thanks in large part to a kickoff return for a touchdown at the start of the third quarter from Tim Carter that gave the Eagles a lead to start the second half. Westbrook Christian was able to score in the final five minutes to take a 13-12 lead, but Vinemont’s offense drove the ball into field goal range where Daniel Flores-Carreno knocked the game-winner through the uprights. Wyatt Thompson picked off a Warriors’ pass on their next possession to ice it. Hopefully the Eagles will be able to carry the momentum from this emotional win with them to Midfield this week for their region opener. After waiting on the weather to pass for nearly two hours, the Bearcats were finally allowed to hit the field to take on the Red Raiders. It proved to be a tough road trip for Cullman, as Decatur found the end zone twice in the first quarter and led the ‘Cats 28-6 at the half. Junior running back Jayden Sullins scored twice in the game for Cullman, but it wouldn’t be enough to catch up to the Red Raiders. Decatur tacked on 10 more points in the second half to seal the region win. Cullman will have to regroup this week to prepare for its homecoming matchup with region foe Columbia. Even after fighting all the way back from a 22-point deficit, the Broncos came up just short against the visiting Midfield Patriots. Holly Pond’s offense found the end zone in the second quarter and a defensive touchdown cut the lead to 22-14 heading into the half. The Broncos recovered an onside kick to start the third quarter and took advantage of the extra possession, tying things up at 22. Holly Pond took a 30-22 lead early in the fourth quarter, but it was all Patriots from that point on. Midfield scored quickly to tie the game at 30 before going ahead permanently on a game-winning touchdown with less than two minutes to play. It’ll be tough for the Broncos at practice this week after a tough loss like that, but they’ll have to refocus in time for their road game with the Hanceville Bulldogs on Friday. The Eagles went on the road for the first time last week, but the results didn’t change. Cold Springs picked up another win to continue its undefeated start to 2018. The Mustangs led the Eagles 12-7 at the break but once the second half started, Cold Springs really started clicking. Sophomore Ayden Alexander picked off a Mustangs pass to start the third quarter and finished the drive on the offensive side of the ball with a 4-yard rushing touchdown that put the Eagles up 14-12. Senior running back Calvin McNabb scored from 2 yards out to make it 21-12, but after a 30-minute rain delay, Southeastern found the end zone again, cutting the lead to 21-18. However, the Eagles offense was able to drain the clock for nearly six minutes and iced the region win with another touchdown from McNabb with five seconds to play. The road win puts Cold Springs at 1-0 in the region and the Eagles will try to stay on the winning path when they host Sumiton Christian this week. The Bulldogs had no trouble at all on the road against Winston County last week. Senior quarterback Zayne Guthrie scored with his legs twice in the first quarter and took one 86 yards just before the half to give Addison a 30-0 lead at the break. Guthrie ran in his fourth touchdown of the night on the opening possession of the third quarter and gave the Bulldogs an insurmountable 38-0 lead. Grant Rice was a big problem on the ground for the Yellow Jackets as well, running for three touchdowns of his own in the blowout win. Addison will be back home this week for the start of region play as the Bulldogs prepare to host Red Bay. Last Friday night was a long one for Bulldogs fans, as J.B. Pennington rolled to a 63-point victory over Hanceville. The Tigers went up 23-0 in the first half and the Bulldogs were able to get on the board with a 40-yard touchdown pass from Fred Ellis to Bo Joles to make it 23-8. Unfortunately, that’s as close as Hanceville was able to get to the Tigers, and after taking a 29-8 lead into the half, J.B. Pennington continued to pull away in the final two quarters. This will be an important week of practice for the Hanceville Bulldogs as they try to regroup for when Holly Pond comes to town this Friday. The Warriors hosted the Aggies for an offensive showcase last Friday night in a game that featured a total of five punts between both teams. The score was knotted at 21 going into the half thanks to a touchdown pass from quarterback Rylan Jones and two rushing touchdowns from running back Hunter Persall. The scoring continued for both teams in the second half, starting with a 57-yard touchdown run from Jones. After Hamilton answered with another score, Jones broke through the line again, this time going for 56 yards and a score to go up 35-28. The Aggies scored three unanswered touchdowns to take a 48-35 lead, but Jones had one more touchdown run in him, this time punching it in on the goal line to make it 48-42 with six minutes to play. The Warriors were unable to convert on fourth down on their next possession and Hamilton was able to drain the remaining time off the clock, sealing the win. The loss puts West Point at 0-1 to start region play, but they will look to balance that out this week when they travel to face Lawrence County. After traveling to play for the first two weeks of the season, Good Hope was finally able to come home last Friday and put on a show for a packed-out home crowd. The Blue Devils were able to squeeze out some points late in the second half, but this one was over at halftime. Quarterback Bailey Quick had a big night under center for the Raiders, collecting two touchdowns through the air and two more on the ground. The Good Hope defense was also ready to play, allowing just 114 yards of offense in the first half, 70 of which came on one play. Senior running back Matt Dixon also found the end zone for the Raiders with a 29-yard touchdown run in the second quarter. The Raiders were able to get a lot of younger bodies on the field in the second half to gain some invaluable varsity experience and held off Cordova 43-24. The Raiders are 3-0 right now and 1-0 in region play with the Tanner Rattlers coming to town this week. This matchup turned out to be a one-sided affair. The Stallions scored early and often, going up 14-0 midway through the first quarter. The Tigers also turned the ball over twice in the opening quarter, putting them in a hole almost immediately. With less than a minute to play in the first half, South Lamar struck one more time on a 38-yard touchdown pass to take a 26-0 lead into the break. The second half featured more of the same. Meek turned the ball over two more times and the Stallions continued to score, pulling away for a 45-0 blowout win. The Tigers will get back to work this week and try to get back in the win column when they host Hubbertville. The Aggies were another local team that found itself overwhelmed last week. After the Patriots scored early in the game, Fairview quarterback Dayne Black burst through for a 48-yard touchdown that kept the game tied at 7. The Patriots ran back the ensuing kickoff to retake the lead and added three more points on a field goal shortly after that. D.A.R. running back Nathan Nelson added two more touchdowns on the ground to give the Patriots a 31-7 lead at the half. 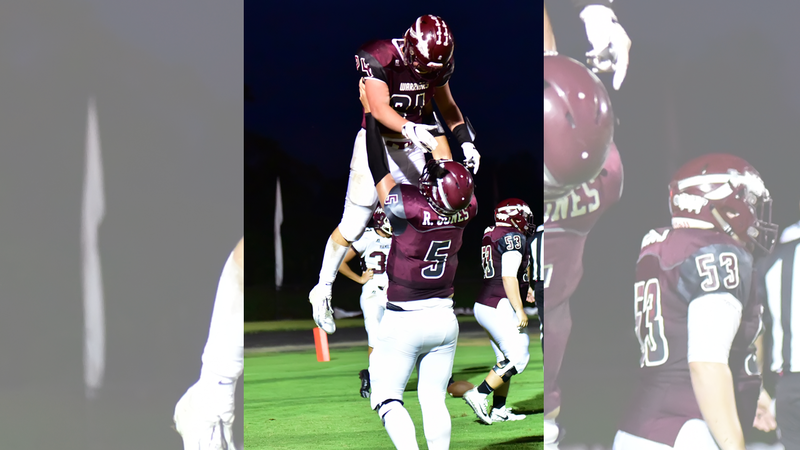 The Aggies were able to find the end zone one more time on another run from Black, but it was too little too late for Fairview. The Patriots cruised in the second half to a 52-15 win to open region play. The Aggies will look to pick up their first region win on the road this week against St. John Paul II.